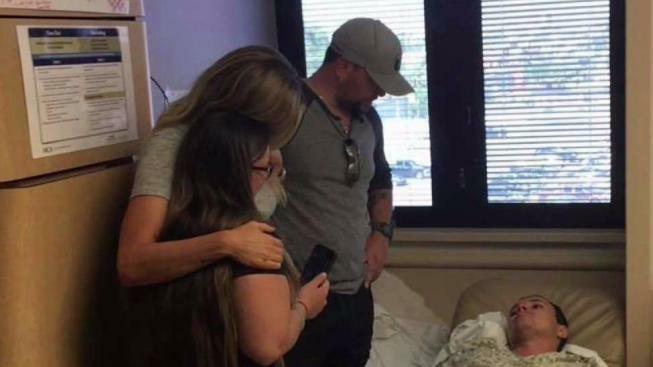 A 21-year-old San Marcos man shot in Las Vegas and his girlfriend got a special hospital visit Sunday from country star Jason Aldean. Zack Mesker and his girlfriend, Lauren Kyander, were at the hospital Sunday afternoon when the singer, on stage during the mass shooting, visited their room with his wife. Mesker was shot in the back as he tried to escape when a gunman opened fire into a crowd of more than 22,000 concertgoers at a country music festival Sunday night near the Mandalay Bay Hotel and Casino. The bullet went through his lower back and colon and down his leg. He has since been released from the ICU and has started walking again, slowly. At least 59 people were killed, including the shooter, and more than were 500 wounded. Mesker's family told NBC 7 that Zack was with his girlfriend when the shooting began -- and he told her to run. "I got a call from his girlfriend that what had happened at the concert and that Zack had been hit," Lorraine Mesker, Zack's mother had told NBC 7 Monday night. "He was in triage and they were asking her to run, to leave the scene." Zack is expected to be OK.
A GoFundMe page has been set up to help with Zack's medical expenses.